Hi first of all Im a Filipino, I've been enthusiast in Bonsai for almost 8 years but I only created my first tree last year. I bought this specimen for only 50 Philippine peso, 2 $US equivalent. I keep on reading, researching, different authors until it discombobulates me, so i gave it a try. I have now 40 selected specimen way back home, Philippines and Im going to transfer them on a pot by this July. I cannot gave my full attention in my hobby due to workload here in Norway as Structural Designer/Engineer, only my Nanay/Mother watering my plants. Too long a time for you to start after eight years but that's ok, It's never too late either. It's not an overnight creation that you'll make but you'll spend some time and patience. It's not simply planting but nurturing work of art. Good thing's you'd had that hands working. Good Luck! May you create awesome works in years to come. A very good job done to this Bonsai. 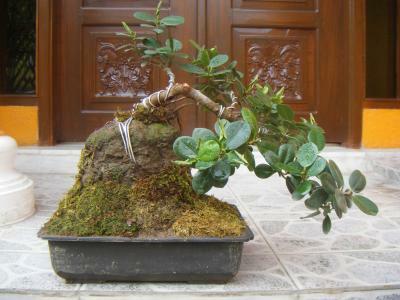 Considering this bonsai is nortured by a beginner. we can buy them in cheapest price but we need to give them millions of care and love.It's not just plant it's also can be a work of art.